- Each clock stream has its individual MIDI output. 2 streams also generate 24-ppq signals (“Roland sync”), while the other 2 provide clock and reset signals for analog sequencers and arpeggiators. - Each clock stream can be time-shifted in relation to the master clock, in extremely small increments as well as in 16th-note steps. The fine shift, too, follows tempo changes. - In addition a constant fine offset can be set for each clock stream to allow compensation of technical latencies. - Each clock stream can be set to double or half tempo, and can be turned on and off without loosing synchronicity. - A swing or shuffle factor can be set individually for each clock stream. The swing pattern can be the same for all 4 streams, or it can be a different one for each. A software editor for these patterns is included. - All functions have dedicated controls, so they can be "played" without staring at a display and poking around in submenus. Calibrated center clicks on all pots allow instant nulling. - Complete settings of all controls can be stored and recalled. All parameters can be remote controlled via MIDI. 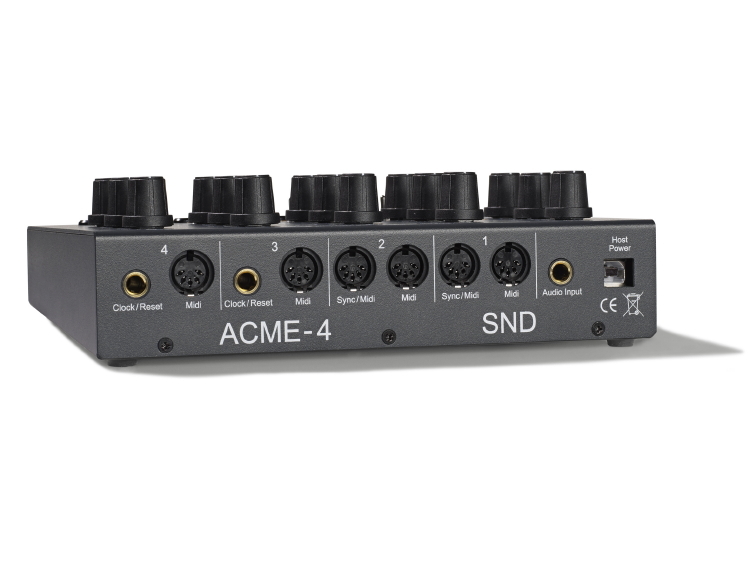 - Like all SND products, the ACME-4 has been designed with great attention to detail. The 32-bit risc-processor ensures lightning-fast reaction. High-grade components (gold-plated jacks, switches, and push-buttons, sealed Alps potentiometers etc.) and a rugged metal casing ensure decades of reliable operation.